We are counting down the last days of the regular session of the Virginia General Assembly, which is scheduled to adjourn on Saturday, March 10. Traditionally, one of the last bills we work on (and perhaps the most important legislation that the legislature has to adopt) is the biennial budget. The Commonwealth's government operates on a two-year fiscal cycle, so this budget will pay for activities from July 1, 2012 through June 30, 2014. Late last week, the House passed its version of the $85 billion budget (House Bill 30) on a 79-21 vote. 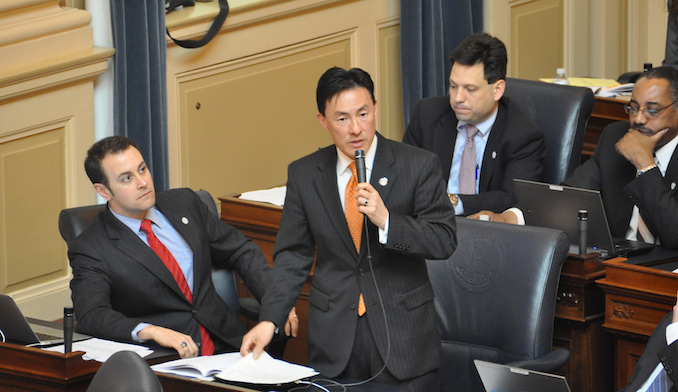 I voted against this bill because it cuts funding for public schools, eliminates funding for critical social service programs such as Healthy Families that assist low-income Virginians, fails to provide adequate compensation for high cost communities in Northern Virginia, and reduces the state's portion of support for local governments. But the biggest problem I have with the House budget is that it takes millions set aside for core functions of government to pay for transportation projects that will not benefit Fairfax County. The Commonwealth already has a dedicated trust fund set aside to pay for transportation. Yet the House budget would put more funds for transportation by taking anywhere from $50 to $320 million per year from sales tax revenues in the General Funds that normally pay for K-12 education, higher education, public safety, and safety net programs for the disabled. Transportation is definitely a high priority for me and for our district. But I am not willing to take millions of dollars that Northern Virginians send to Richmond through our sales taxes -- which is over one-third of all sales taxes collected -- and then have that money diverted to pay for road construction in other parts of the Commonwealth. Under the House bill, Northern Virginia will receive only about 7% of these funds to fix our local traffic problems. During the committee process, I offered amendments to fund some of my priorities, such as additional transportation revenues for our area that would come from user fees, ending $30 million of ineffective tax credits to the coal industry, and giving paid sick days for home healthcare workers who earn so little. However, the budget that came to the House floor did not include my amendments. In my first term, I learned that the budget-drafting process is fluid, and funding for issues like education, transportation and social safety nets generally improves as legislation moves from the House to the Senate and through the final "conference committee" process. That is why I concluded that I would vote "no" on the House budget and see what the Senate sends us as improvements. Last week, Senate Bill 30, the Senate version of the budget, was defeated on a 20-17 vote when it needed 21 votes to pass. Today, the Senate blocked passage of House Bill 30 along party line votes. As you may read in the news, some of the reasons that the Senate failed to act on the budget go back to disagreements over how the Senate organized itself when it convened with an even 20 Republicans and 20 Democrats. Other concerns involve differences between the two parties over priorities to be funded in the budget. In the legislature, which is an inherently political institution, it's difficult to prevent politics and partisanship from influencing policy-making decisions. So, for now, we simply need to wait and see how the budget process plays out in the Senate. I am hopeful that the Republicans and Democrats in the Senate can come together soon to enact a good budget for the Commonwealth. I will keep you updated on the progress over the coming days. Thank you for the privilege of representing you in Richmond. Please let me know if you have any questions!